The climate can be too hot and rainy in the summer, too cold and windy in the winter. But motorcycling conditions in the high desert during the spring and fall months are nearly perfect. 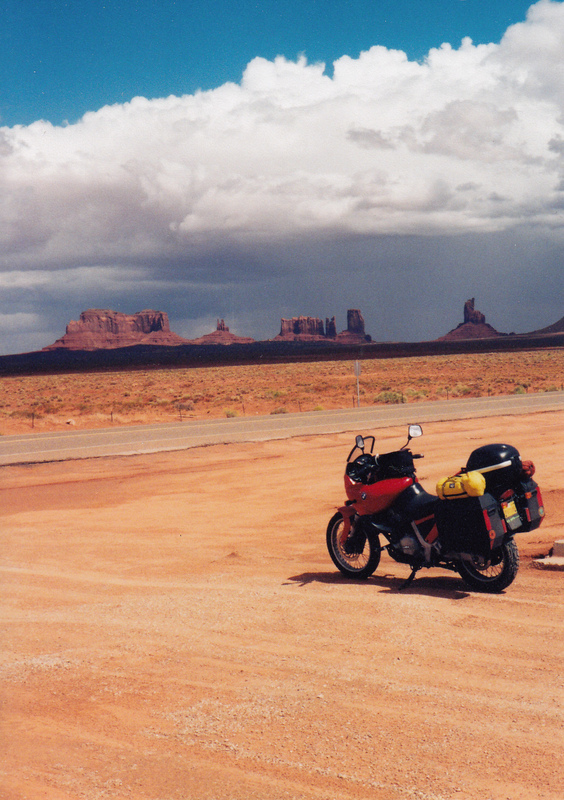 A commitment-free week in September beckoned my husband and me to ride the Indian lands of the Southwest, following a loop route that offered cultural, historical, and scenic highlights. A little frost, a stiff crosswind, a brief rain shower, a sunburned nose – these minor inconveniences simply reminded us that we were not looking at the landscape from the inside of a car. 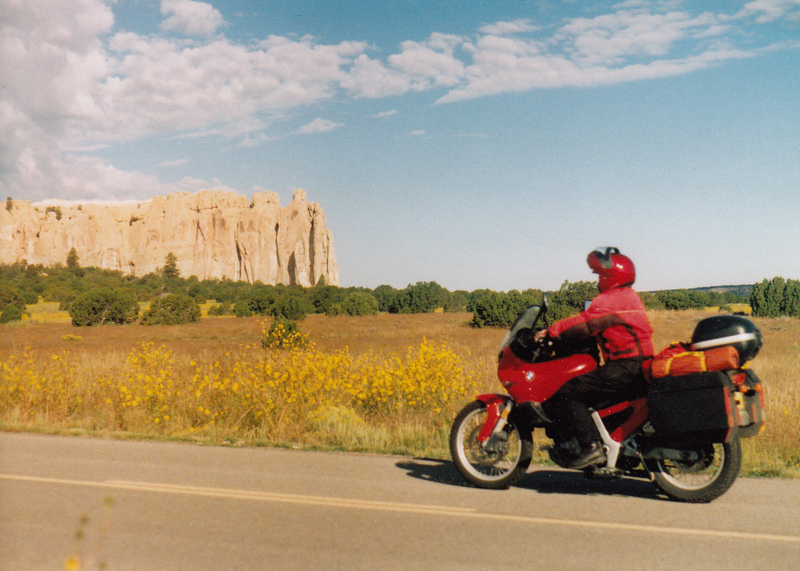 We began our ride in a place that bears traces of the waves of migration characterizing the Indian lands. Following the Ancient Way Highway from Grants, New Mexico off Interstate 40, we reached El Morro National Monument in the early afternoon. The tall sandstone cuesta offered centuries of passers-by an irresistible blank slate on which to scratch pictures, names, dates, and narratives – graffiti elevated to historical treasure. Earliest are drawings by ancestral Puebloans (also known as Anasazi in the Navajo language). These ancient people lived on top of the rocks in a village called A’ts’ina. 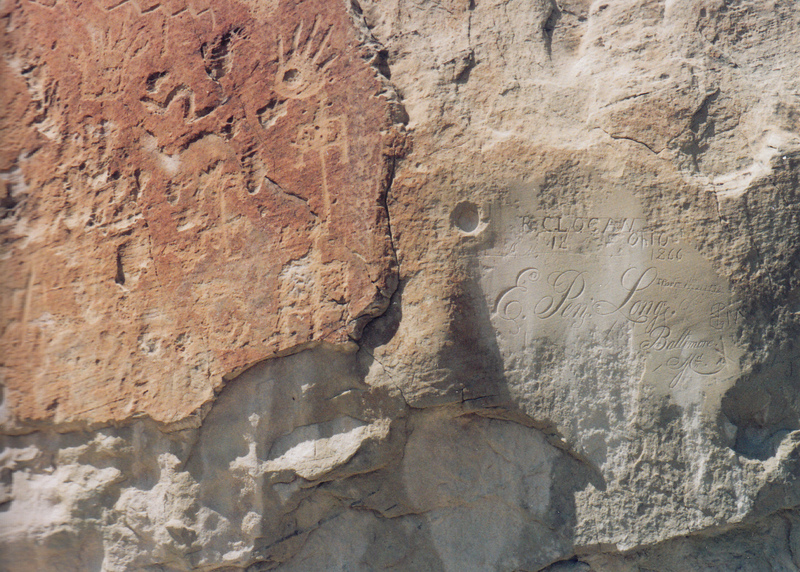 Next, 17th century Spanish explorers such as Don Juan de Oñate and Don Diego de Vargas etched ornate inscriptions into the rock face commemorating their passage. Finally, Army soldiers and tough American pioneers heading west in the mid-1800s added their signatures to the rock. Open fields around the monolith flashed with a riot of wildflowers, paintbrush and globe mallow and purple asters and sunflowers, yield of heavy summer monsoon rains just past. A small campground within a mile of the inscription rock provided our night’s lodging. Convenient piles of free firewood, product of a juniper eradication project, took the chill off a starry evening at 7,200 feet elevation. 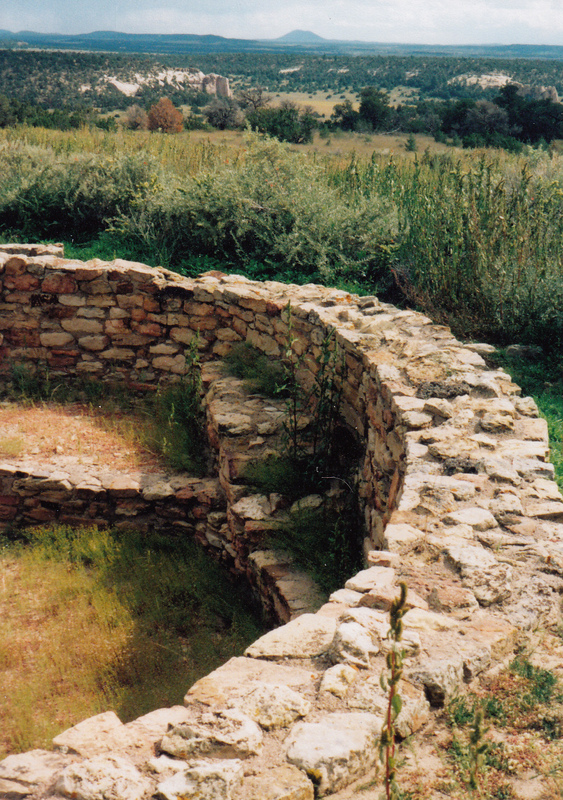 A dirt road south of Zuni leads to the ruins of Hawikuh, site of the first contact between Zunis and Spanish in 1539. Explorers searching for the legendary “Seven Cities of Cibola” saw sunlight glinting off mica flakes in the windows of Zuni pueblo dwellings and mistook it for gold. Today most of Hawikuh remains buried under a heap of red dirt. A check-in with the Zuni Visitor Center is required before touring the site; the Zunis ask that visitors respect the ancestors by leaving any found artifacts in place. From Zuni we crossed into Arizona and headed south to St. Johns. There we rode west through scrub-covered hills to reach Petrified Forest National Park. Though Petrified Forest is known mostly for its fossils, park researchers have inventoried over 500 archeological sites, including Puerco Pueblo and Agate House. Besides dwelling site ruins, the native people of the Little Colorado River region left drawings of humans and animals, as well as geometric patterns and spirals, chiseled on flat slabs of sandstone. Archeo-astronomers discovered that the spiral petroglyphs function as calendars. Shadows or sunlit images move across and pierce the center to mark important annual events such as solstice, equinox, and the start of the frost-free growing season. This phenomenon occurs elsewhere in the Southwest, but Petrified Forest contains the largest known concentration of these ancient almanacs. Indian connections aside, riding through Petrified Forest provided astonishing views of the Painted Desert, Crystal Forest, and the Teepees, interspersed with many fun twisties. It seemed a shame to stick to the posted 35 mile-per-hour limit. Passing slow motor homes, we leaned into the scenery and too soon emerged onto Interstate 40. Fifty miles west of Petrified Forest we reached the ruins of Homolovi, four distinct villages populated along the Little Colorado River during the 13th and 14th centuries. Native oral tradition recounts that Hopi Indian ancestors came from this part of Arizona. 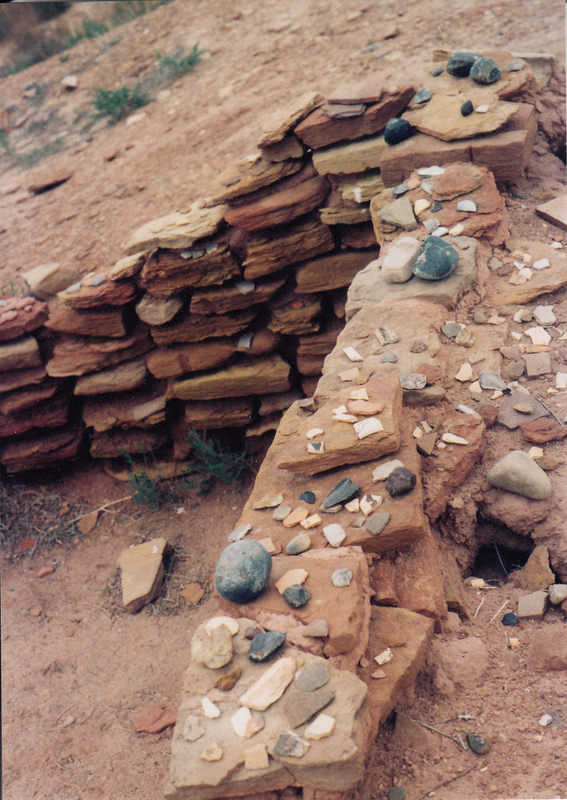 Archeological work on the ruins, supported by the Hopi tribe, is ongoing. Few people ever exit the Interstate long enough to visit Homolovi State Park; even fewer actually spend the night there. But we found the campground comfortable (if a bit windy) and the showers blessedly hot. A walk through the ruins of one village presented us the opportunity to finger 800 year old black-on-white, gray corrugated, and black-on-red pottery fragments. Taking a shard home crossed my mind, of course – who doesn’t consider pocketing a souvenir? But in the end I left them where they lay, because on my living room mantel, these ancient relics would lose their context. 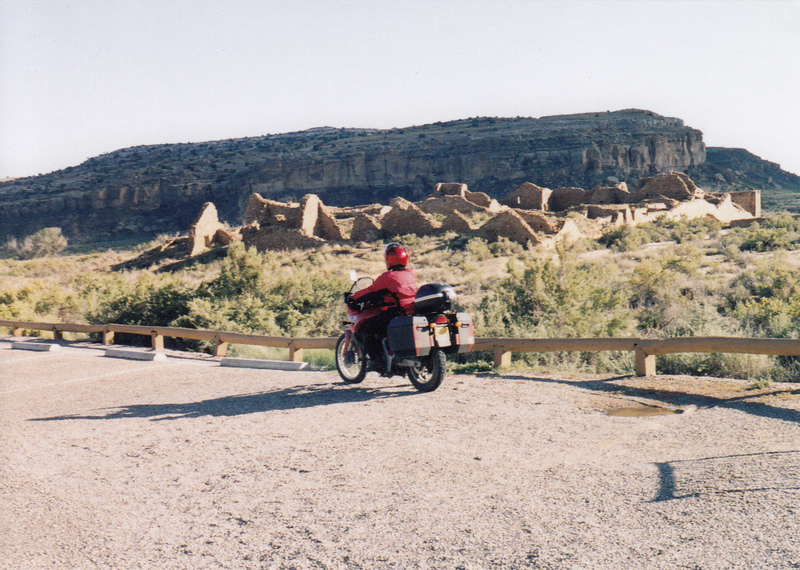 We rode north of Homolovi to reach the Hopi Cultural Center on Second Mesa. A three dollar entry fee allowed us to view the museum’s historical photographs of life on the Hopi mesas a hundred years ago. Ancient, lined faces of Hopi elders and camera-shy children peeking from behind their mothers’ skirts provided a window into an exotic, bygone world. Today Hopis continue to weave, carve, dance, make jewelry, and celebrate the celestial seasons much as their ancestors did. But the Hopis also have a foot firmly planted in the modern world. A patriotic people, a high percentage of young Hopi warriors volunteer for the armed services. The first American woman killed in Iraq, back in 2003, was Hopi. East of the Hopi mesas the road led to Hubbell Trading Post National Historical Site. A remnant of many such outposts established a century ago, the Hubbell Trading Post still buys rugs, jewelry, and baskets made by local Navajo Indians. In browsing through several rooms of the store, I learned that my taste was champagne: the Ganado Red rug I picked as a favorite carried a price tag of $2900. We listened to a talk given by the museum curator later that day about his experiences living among the Navajo. He recounted attempts to speak the difficult Navajo language and participate in traditional dances. I admired his willingness to let go of his own viewpoint – that of a single white man from Michigan – and share perceptions gathered by close observation of Navajo customs (limp-wristed hand shaking), taboos (pointing with the index finger), and etiquette (never interrupting a speaker). 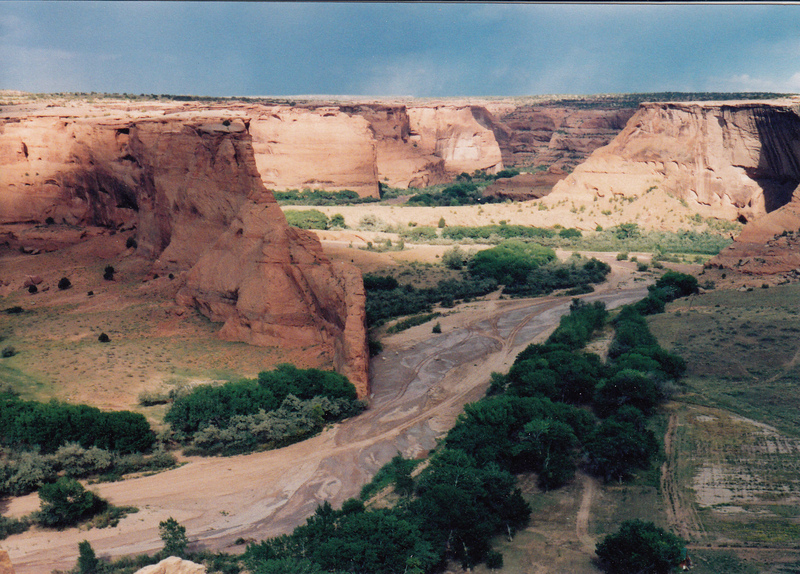 Thirty miles up the road from Hubbell, Canyon de Chelly National Monument preserves a canyon inhabited by Navajos who farm the rich bottomlands. We rode both the north and south rims of the canyon, pausing often to take in startling views of slickrock domes, slot canyons, and cliff dwellings tucked into caves along Chinle Wash. Visitors are allowed foot access into the canyon on White House Trail, but traveling anywhere else within the monument requires a Navajo guide. Half-day tours by foot, horseback or jeep cost $50 to $130 per person. Unfortunately, dual-sport motorcycle trips into the chasm were not offered as an option. Too bad, because the rutted dirt roads on the canyon bottom just begged to be navigated by my BMW F650. Ah, well. The brick red soil of Navajo Land reflected pink on the underside of puffy cumulous clouds. Sheep, goats, horses, cattle, even a donkey grazed along unfenced roadside fields. We stopped at Amigos Restaurant in Kayenta to fulfill the time-honored tradition of consuming a Navajo taco – in this case, a humongous round of fry bread topped with mountains of beans, chili, and cheese.Storm clouds gathered as we approached Monument Valley. A brief stop at Goulding’s Lodge brought back memories of watching John Wayne movies on Saturday afternoon: many of those classic westerns were filmed in the canyons behind Goulding’s. With rain looming ahead, and arroyos flash-flooding beside the highway, we sailed through the valley. We reached cover at a campground in Bluff, Utah just moments before the clouds delivered their promised deluge. A male rain, the Navajos call it, intense and violent. The gentle sustaining rains that characterize the winter months they designate female. The Indian lands route led us past Four Corners and up to Aztec, a national monument named by someone who mistook the pueblo for ruins found deep in Mexico. On the contrary, Aztec looks nothing like the Pyramid of the Sun. But its three-story dwellings, giant round kivas, and T-shaped doorways bear remarkable similarity to both Mesa Verde to the north and Chaco to the south. We inquired about the road to Chaco. A flash flood had run across the road, but the ranger said the water was receding, so we decided to chance it. The last fifteen miles of wet dirt into Chaco were recently graded and fairly smooth. At Escavada Wash, water twelve inches deep rushed across an arroyo bottomed by concrete. I plunged ahead; what’s a dual sport bike for? My lower legs and boots took a drenching in the muddy bath, as did my husband’s Gold Wing and sidecar, but we successfully completed the crossing and proceeded into the park. 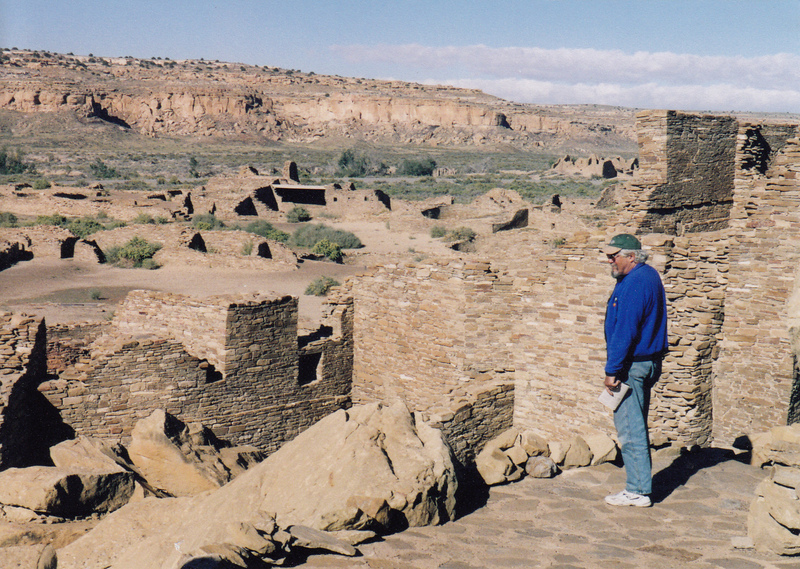 Chaco is the granddaddy of ancestral Puebloan ruins. Consensus among contemporary archeologists is that Chaco was a rendezvous place for residents from throughout the Southwest. The wind whistled past crumbling walls of Pueblo Bonita’s great houses and kivas. Remnants of ancient voices floated through empty rooms. Obviously a huge effort went into building this sandstone city. What drew hundreds – perhaps thousands – of Native Americans to traipse to this remote site? But then I thought about modern motorcycle rallies – Sturgis, Daytona Bike Week, Laconia. Perhaps human nature hasn’t changed so much after all. We still gather in large numbers to party, play games, tell stories, meet people, flirt, dance, feast, drink, buy and sell trinkets, argue, and philosophize. Perhaps Chaco was nothing more than the Sturgis of the Anasazi world. Thinking of it in those terms humanized the place for me. Picturing the ancient inhabitants of the desert playing “bite the weenie,” kicking stone tires, and collecting Poker Run cards in the sandstone plazas kept me chuckling all the way out twenty miles of washboard dirt road. Eventually we reached pavement, gas stations, ice cream, and yet another winding road which led back to Interstate 40 and Grants, where our Indian lands ride had begun.